In a small bowl, combine brown sugar and beer to form a thin syrup. Set aside. Lay bacon on a lightly greased baking sheet. Remove from oven, brush the syrup onto the bacon. Flip and brush the other side. Return to the oven and cook for an additional 10 minutes. Rub a lime wedge on the rim of the glasses. Then dip the rims in a saucer containing the sea salt. In the glass, combine the Omission Beer, lime juice, Worcestershire sauce, soy sauce, Tabasco sauce, and cracked peppercorns. Add the crushed ice and seltzer water. Stir. 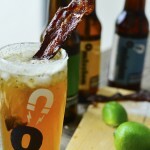 Drop the candied bacon strip in as a stirrer or as a garnish.